Since Liu’s last appearance at the CIFSS meet, she has won the 100 and 200-yard freestyle titles at the inaugural CIF State meet and committed to UCLA. Liu, who was also named the 2015 Daily Bulletin swimmer of the year, enters the 200 free event as the No. 1 seed with a time of 1 minute and 46.73 seconds. The Ayala Bulldog also seeded No. 1 in the 100 free with a time of 49.21, topping her meet record of 49.72. She is also expected to defend her 200 free relay title with teammates Shannon Steele, Mikki Thompson and Megan Delgado. The team’s performance of 1:36.30 was a meet record and enter with a seed time of 1:36.11. But the top seed in the event goes to Crean Lutheran with a time of 1:35.91 and will look to prevent a Bulldogs’ title repeat. Thompson holds the No. 2 seed time in the 200 individual medley and 500 freestyle. Steele will also compete in the 500 free. Pepper, who was the San Bernardino Sun swimmer of the year, will represent the Terriers in the 50 free and serves as an alternate in the 100 free. She will also compete with teammates in the 200 medley and 400 free relays. The 100 free is a shake up for Pepper after competing in the CIF Finals last year in the 100 backstroke instead. In the 50 free, Pepper finished third with a time of 24.14 and qualified for the state meet. 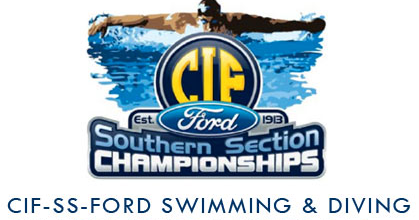 Delgado, Emily Rigsby of Redlands East Valley and freshman Emily Trieu of Los Osos will also compete in the 50 free. Rigsby and Emily Longfellow, a commit of Houston State, lead the REV Wildcats after a dominant team performance in the Citrus Belt League finals. REV freshman Sydney Benveniste, who competed over the summer at the junior nationals will compete in the 50 free and 100 butterfly as part of her CIFSS debut. Sophomore Autumn D’Arcy will join Benveniste, Longfellow and Rigsby in the 400 free relay event. D’Arcy will compete in the 100 backstroke and 100 butterfly event. In Division 4, the Alta Loma Braves set a school record with a second place finish in the team standings at the CIFSS meet in 2015 and could be in line to finish strong once again with a number of athletes returning. Junior Mia Bailey will compete in the 100 and 200 free events for the Braves. She finished second in the 500 free in 2015. Alicia Ellingson will represent the Braves in the 100 backstroke while Vanessa Murray will compete in the 50 free. All three of the Braves made the 2015 Daily Bulletin All-Area swim team. This entry was posted in Alta Loma High School, Ayala swimming, Baseline League, Citrus Belt League, Redlands, Redlands East Valley and tagged Ayala, CIFSS Swimming, Kenisha Liu, Los Osos, Redlands, Redlands East Valley, Swimming and Diving by James H. Williams. Bookmark the permalink.